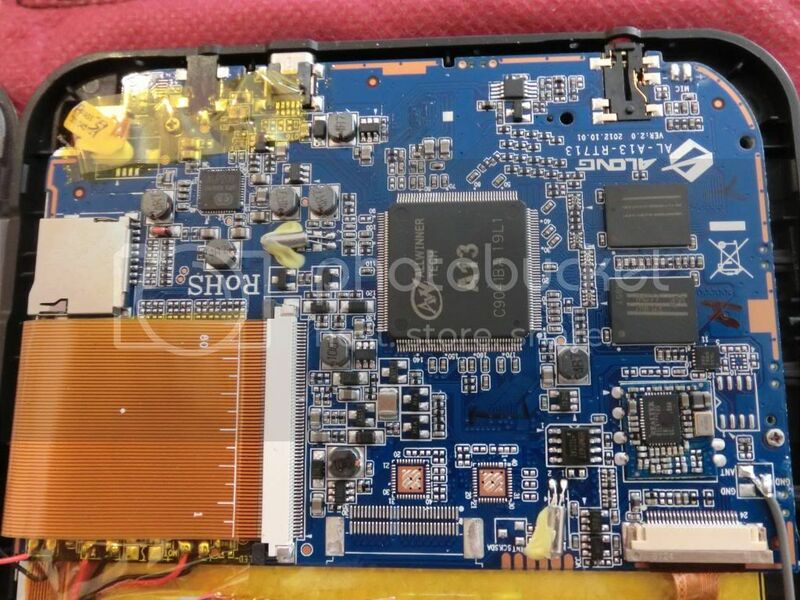 This refers to the XZPAD700 (aka zeligpad) ARM based tablet (AL-A13-RT713 pcb) based on an Allwinner A13 SOC but is technically applicable to all Axx SOC's as to my understanding the all boot in the same manner. If you're just interested in getting started really fast skip to the image builder section. The image builder has support for almost all Allwinner Axx SOC's. I've thoroughly tested it on mt tablet and I've had success reports on Cuietruck. If you have had success on some other device please report it on the Slackware ARM subforum on LinuxQuestions. Although this is a low-end inexpensive device it turns out that the platform is better documented then many other high-end devices with well known brand names. For this platform there is a lot of good documentation on http://linux-sunxi.org/Main_Page but unfortunately there are some common issues with most other ARM based patforms: Patches not making it to mainstream kernel, Drivers left in a incomplete state that that require hard ti find firmware to work properly, Drivers unmaintained that get broken as other back-ports make it into the linux-sunxi kernel tree. Enough ranting about how ARM linux development lacks organization, let's just gather some information out of this device to help install a standard linux userland (possibly Slackware) on it. Untill more is known on the hardware (revealing where the serial port is) there are 2 basic ways of accessing the device so that you get a command prompt. The former requires installing android-sdk on a pc, activating the developement debug mode on the device, connecting the device to the pc via the usb cable and then launching “adb shell” from the pc. You then gret dropped into a shell prompt on the device. The latter only requires you to install a terminal emulation software on the device and then using that to snoop around on the device itself. Where possible I prefer using adb because I get frustrated while typing on the virtual keyboard. In both cases you may need to root the device to get full access to the system but on the XZPAD700 it is not the case as you can just type “su -” and become root right out of the box. It appears the the device has a serial port but it's not where one would expect. This device comes with a smart feature: the MicroSD (uSD) Breakout featuring JTAG and UART connectivity trough the uSD socket but be warned that you may only use one option at the time (ie you cannot have the UART if you use the uSD). More on this later. This tablet comes with a mini-AB port with true host/slave functionality. According to the devices specifications it should be an OTG port but it's wildly out of spec as it can power up HDU units, internet 3G sticks and other stuff that is typically close to the 500mA limit on standard USB ports. The A13 has another USB port that is dedicated do the internal WiFi card. There's an article on wikipedia that may be useful to those wishing to make their own adapter for the mini-A socket to put the port in HOST mode. With the stock android on the device I've used successfully all sorts of devices without the use of externally powered hubs, but at time the linux-sunxi kernels make get broken OTG driver. In any case as of 3.4.75 I was able to get the USB Ethernet cards working on the OTG port. nandj: x86 boot sector, code offset 0x58, OEM-ID "android ", sectors/cluster 8, heads 64, sectors 3955658 (volumes > 32 MB) , FAT (32 bit), sectors/FAT 3856, Backup boot sector 2, serial number 0x4a9d1407, label: "CRANE      "
This is my guess to why the ft5x driver has not yet made it into the mainstream kernel: it appears that this driver needs a firmware blob bundled into it to make it functional. This firmware blob depends on the hardware implementation of the platform making it darn hard for an end user to get a working driver for any kernel that is not what came stock with the hardware. Technically the code is GPL, and with that basic code you get some sort of basic but flawed functionality, but without the blob it's pretty much useless on a tablet. I've found evidence of U-Boot configuration environments on nanda and nandb. and features a single cortex A8 core @ 1ghz and mali400 GPU @320mhz. There is a lot of very useful information on the linux-sunxi.org main page . In particular there is an interesting article concerning how the Allwinner SOC based boards boots. This gives a fair idea on the alternatives available for booting custom images besides being an interesting read anyway. If you don't want to tinker you can buy a ready-made UART and JTAG uSD breakout header ready to use on A10/A13 devices from here . But be aware that you may use only one feature at the time, so if you intend to use the uSD slot for storage you will not be able to use the UART. See the Wrapping Up section of this article for links to the image builder I'm currently using. Although a lot of information in this section comes from linux-sunxi.org I'll rearrange it here removing any distro oriented stuff that is not pertinent to Slackware and keeping it as neutral as possible anyway. 1 is available from the A13_mid hardware pack v 3.0 or v 3.4.Alternatively you can try building your own kernel from linux-sunxi source tree (be warned that a lot of patches for the Allwinner SOC have not yet made it to mainstream kernel). 2 needs to be ripped out of the nanda partition on the device itself, failing to do this will result in a kernel panic due to incorrect setup for kernel. 3 and 4 need to bi ripped out of the fedora image for Axx as the ones that come in the hwpack seem to fail booting on this device even with the correct script.bin. Our userland is going to be one of these because we are Slackware freaks but you can have anything else you like (prepare a large enough image to hold whatever you prefer). There are other various things that could get you booting with a little work but I like to keep things as neutral as possible so that if you are not a Slackware freak you can still use most of the information here to boot whatever suits you best. Jeff Doozan has a rescue system for the A10 SOC systems,there is a thread on Doozan's wiki regarding his rescue system. BerryBoot also supports booting custom images for the A10 SOC. Thierry Merle's Flash Kitchen has a working solution for the A10. TheSlackware ARM 14 miniroot can fit in 200Mb so I guess the absolute minimum would be 256Mb uSD but that's not going to be much use on a tablet, I'd reccomend starting off with a 512Mb uSD. If you want a functional X11, with a minimal window manager like fluxbox and various usefull libraries, a working gcc compiler along with some extra networking stuff you're looking at around 1.6Gb of occupied disc space so I guess that you can do with a 2 commertial Gb uSD. Once you convert the space in to real GB, take away the boot partition space and create the filesystems you'll not be left with much usable space … maybe just enough to download the compressed kernel sources tarball. Let's try with the just to check everything works. Now let's partition it (sfdisk that is on my linux has a bug that forces me to use sectors as units, it would be handier if you can use Mb as units). The crunch of is is that the firs partition needs to begin 1Mb from the beginning of the device and at least 16Mb big. Older u-boot builds for this platform required the boot partition to be vfat, but this in no longer mandatory with the newer builds and ext2/3 are now valid for boot partition too. You will need a 16Mb boot partition (offset 1Mb from the beginning of the device) and at least one partition for the system. In order to format correctly the filesystems on the raw image we need to use of losetup with offset and size. Remember that the first partition begins 1Mb from the beginning of theimage and that the root filesystem will then begin 17Mb from the beginning of the image. The filesystems can now be mounted so that we can deposit the required files in them. Unlike flash specific filesystems like jffs2 the linux journaled filesystems ext3 and 4 are designed to work on ordinary block devices, the way blocks are rewritten and the way the journal is used was not conceived to be conservative on the number of rewrites cycles on flash devices. Also the way block rewrites take place does not take into account that the erase block of a flash device is typically 32 times bigger then the block that the fs driver wants to write, resulting in a physical rewrite of much more data then the the block that was requested to be flushed to disk. Be warned that while most SLC flash devices allow for 100000 rewrites MLC devices typically only get 10000 rewrites before failure. Most low end flash devices are MLC. If you really want journal at least make sure you mount the device with the noatime,data=ordered option or you will literally burn out your uSD card really quickly. This is why I format most of my root filesystems on flash devices that get managed like ordinary IDE/SATA/SCSI/SAS devices as ext2, but there is a major issue with portable devices: an uncontrolled reset can drop your device into a prompt for root password for maintenance, and if you don't have a keyboard handy you are screwed untill you get hold of one … so I sujjest this device be formatted with a journaled root filesystem. In the boot partition you need to deposit kernel in a format that uboot will manage (uImage) along with script.bin. To mount the vfat boot partition we can still use the loop0 device. the a13_mid_hwpack.tar.xz is the hardware pack that can be downloaded from the link above. If you are interested in making an initrd setup (for whatever reason) you might find this an interesting read. In this partition you need to extract a root image. On linux-sunxi.org it is suggested to use an ubuntu-alip image but we are slackware freaks so we will use one of these miniroots. You may actually use any userland that is compatible with the cpu architecture. The sun51 is an CORTEX A8 AMM v7 instruction set so it will likely run any userland available as long as it's compiled in a ABI format compatible with the kernel you put in the boot partition. Just keep in mind that this device does not have a physical keyboard, not all standard linux include virtual keyboards amongst their packages. You might want to add to your root image xvbkd and have it fire up along with xdm (or whatever other manager you choose to run) so that you can login. Unfortunately the bootloader stuff supplied from the hwpack seems to be broken, it's best to rip the bootloader stuff out of the fedora image for the A1* family. You may now write the image to a uSD card with a simple cat redirected to the card's block device. Slip the card in the uSD slot and boot your device. The image builder is for brewing up an arbitrary size SD image to match whatever size SD you have. It is technically possible to use a 256Mb SD for a Slackware ARM miniroot system with little space for a few extra packages, but I advice to start off with no less then 1/2Gb SD card. You will need to know what type of architecture your Allwinner SOC is (sun4i, sun5i or sun7i) before you start: look this up here. It is also possible to use this image builder with other distribution's root images but it may require a little manual work if the target distribution does not have the modules in /lib/modules/<kernel version>. Here's a link to the image builder I'm currently using (it has inside all you need to get the Slackware ARM 14.0 or 14.1 miniroot booting on many Allwinner SOC based devices) just download all the files and you're ready to go. The files are also available via http or via rsync. I've thoroughly tested it on mt tablet and I've had success reports on Cuietruck. If you have had success on some other device please report it on the Slackware ARM subforum on LinuxQuestions. I'll leave the slightly older version on sourceforge as a tarball for a while. It's not really the right place for it as it does not fit in perfectly with my clashNG project but it's related so I hope sourceforge won't mind having it there for a while. There is a documented procedure for booting this tab over network http://linux-sunxi.org/How_to_boot_the_A10_over_the_network. Getting the device to do a normal installation would probably only require having a working kernel for this hardware. Changing the kernel logo will require fiddling with the kernel so we'll skip that until I manage extracting it from the internal flash or compile a working version of my own. But it's easy to change the uboot splash and the android boot animation. you then need to create a 800×480 windows bitmap image of whatever you prefer and call it slack.bmp. This should be copied over to the linux directory in the nanda partition and then you can umount the nanda partition. Next time you boot normally from the internal flash uboot should show the custom image before flipping over to the linux kernel logo image and subsequently to the android bootanimation. Next time bootanimation binary is executed it will find and load the custom animation. You can execute it manually from a terminal application or from adb shell. If your animation is an infinite loop you can hit CRTL^C to quit execution from the shell that you used to launch it.